We spend a lot of time perfecting our résumés only to fall apart when we finally get called for the interview. Dr. Travis Bradberry has compiled a very nice article on preparing for that all important interview. Please take a few minutes to read this article and increase your odds of getting the job. Click here if you’re ready to improve your interview skills. Interviewing for a job can be intimidating…but it doesn’t have to be! Join us for this workshop to learn interviewing principles & strategies to bring in job offers. 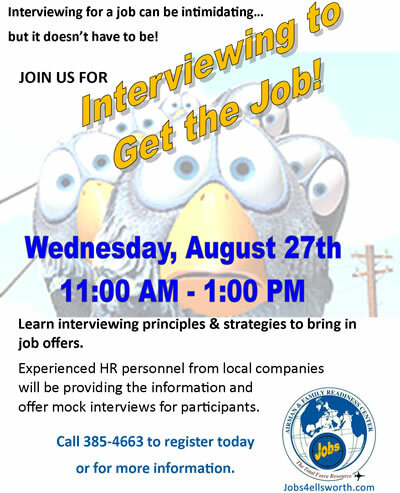 will be providing the information and offer mock interviews for participants. Oddball questions may seem to have nothing to do with an open job position, but companies are increasingly asking these types of brainteaser questions to determine a candidate’s ability to think on their feet, think critically, problem solve, and effectively talk through a response. Keep in mind, there aren’t always right or wrong answers to these questions, but they can still be tricky. If an interviewer asks you a wacky question, try not to get knocked off your feet. The point of such questions is to see if you can keep it cool under pressure, so don’t be afraid to answer in a creative way. You want to make the interviewer remember you -and these types of oddball questions offer a great opportunity to do so. Good luck!